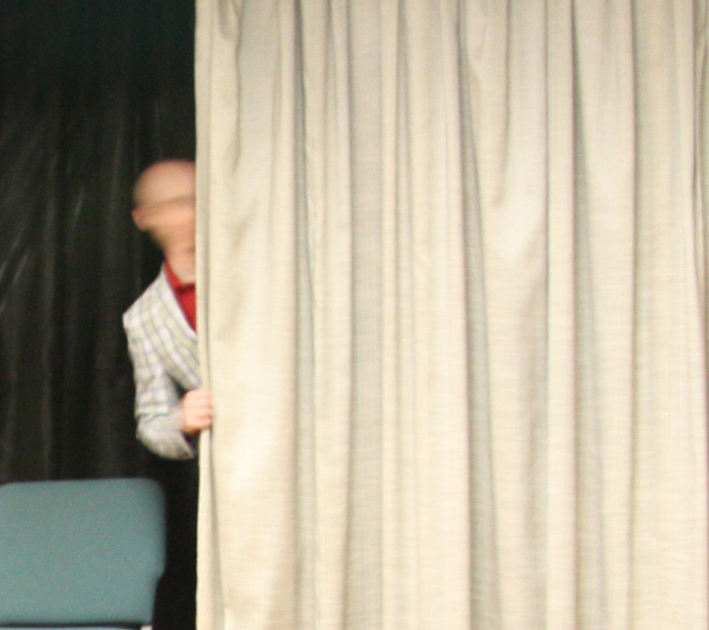 Going on stage can be terrifying, and this apprehension isn’t reserved for first timers. Acting and public speaking are very similar, in that there is a group of people watching you and reacting to what you say and do. While I do have public speaking experience (in that I’ve spoken in public before – so I guess that counts) performance is really what we’re going to focus on here (although the skills are transferable and a great reason to take a theater class). It’s important to remember how powerful the stage is – it can (literally) make or break a person. I was inspired to write this piece because of a recent situation. A couple of months ago I was doing a show, and a young actress was to perform a monologue – this would be the first time she ever performed on stage. She was nervous when she went on, blanked on a line, didn’t know how to recover, cursed, panicked, and ran off stage. She collapsed in a corner and didn’t move for 20 minutes. It was a horrible experience. I didn’t see her for 4 days, by which time she had recovered (as best she could, I suppose). I realized that part of the problem rested with me – I hadn’t prepared her properly. Not only was she unprepared to go on stage, but she also didn’t know how to recognize the signs of stage fright, cope with them, or recover if something were to happen while performing. All of these factors added far too many variables and certainly worked against her having a relaxed, successful performance. Similarly, another young actress, in an audition, was so terrified that every time she went to open her mouth she broke down and cried. We were there for an hour. She wanted to audition, she wanted to do the show, but the fear of even auditioning for less than a minute completely crippled her. I tried my best to talk to her and calm her down, but that level of stage fright is something that is beyond my knowledge. Never had I seen something this serious before (update: she eventually coped with her anxiety and successfully auditioned). So, inspired by these incidents, I decided to do some research and read up on stage fright. I’m still learning, so I certainly don’t have all the answers (and won’t pretend that I do). I decided to use this post as a source of information, and the following links lead to resources that I’ve found helpful. For additional help, I’ve summarized some points below and added a few of my own observations and strategies that have worked for me that have more of a theater angle. Why do people get stage fright? For plenty of reasons. For actors, perhaps the biggest fear is blanking. That is, forgetting a line or where to move and not being able to recover. There is probably nothing more terrifying than going on stage and not knowing what to say or do. And this is even worse if you knew what to say and do, but forgot. No one likes to feel like they aren’t in control, and panicking on stage, in front of an audience, creates a vicious circle of anxiety. The fear of this happening is one of major causes of stage fright. What happens? What are the symptoms? This is the body’s “fight or flight” response, and these physical manifestations enabled our ancestors to run from Woolly Mammoths, velociraptors, and ancient aliens. It either gives us the necessary tools to run far away very quickly, or stand our ground and fight. Our brains and bodies work together, telling us that we’re in a dangerous situation and that we need to prepare for battle. How can we cope with it beforehand? Since theater is hardly a life or death battle (insert your joke here), we need to convince our bodies and minds that we’re in no physical danger, and remove any of the potential stressors that could be causing the anxiety. The best way to de-stress is to over prepare. Know your lines cold. Nothing adds or detracts from confidence more than preparation. Leaving little doubt to your personal level of preparedness helps you to relax and gives you confidence – both elements are essential to quick thinking on stage. Exercise: Work out the extra adrenaline and feel physically and mentally stronger. This includes vocal exercise. Arrive early: Give yourself time to get into the mindset of performing. Walk the theater, the stage, and get acquainted with your dressing room. Acclimate yourself into the environment before the craziness begins. A little stress-free quiet at the venue is much, much better than rushing to try and get there on time. Diet: Avoid eating heavy meals on performance days. Stick to protein, keep it light and healthy, and stay hydrated. Being a little hungry is good (but not to the point of light headedness) – it makes sure the blood goes to the head and not to the stomach. Trust me on this one. I’ve seen it proven over and over again. Avoid caffeine and alcohol: An upper and a downer. Both affect the way we function. Avoid dairy: It creates unpleasant phlegm and can upset your stomach. Focus on your character and performance: Getting into character early, visualizing your performance, and having positive thoughts about the entire experience will help you transition from backstage to onstage smoothly. How can we recover if something goes wrong on stage? Improvising: Know all of the subtleties of your character, the other characters, the scene, and the play (this goes back to being prepared and confident). With all of that important information at your disposal, and the confidence that comes with knowing it, you’ll be in a much better place to improvise, should you have to. It’s a powerful tool, but one that should only be implemented as a last resort (i.e., if there’s absolutely no other way to stay on script). That being said, knowing you have the ability to seamlessly – and in character – improvise your way back into the scene is another way to build your confidence (there isn’t enough room in this post to go into how you build that ability – but look into improv if you never have). Another way to look at this is through a simple metaphor: build a bridge. A bridge takes you from where you are to where you have to go. Get to the next part of the scene as quickly, strategically, and logically as possible. This means staying in character, relaxing, and making it look like nothing went wrong. In this moment, knowing your character and the play exceptionally well will be your savior (see the part about “overly preparing” above). If you’re struggling with stage fright, or know someone who is, remember that the audience is really on the side of the performer – the audience wants you to succeed and they want to be entertained and moved – so you’re really at an advantage already. You’re there to have a great time on stage and the audience is there to watch you and feel like they are a part of something. That’s really the best part. Stage fright plagues even the most seasoned performer. If you are having serious anxiety problems, you should probably seek professional help. I am not a doctor. I can’t guarantee that these methods will work for you.